The defending state champion Penn Kingsmen Girls Soccer Team has advanced to Semi-state in the IHSAA State Tournament and will face a tough test as it squares off against Noblesville in Kokomo on Saturday, Oct. 21. The match is slated to start at 3 p.m. It will be a match-up of not only two of the Top 5 teams in the state, but in the Country. Penn (21-0-1) is ranked No. 1 in the nation by topdrawersoccer.com, and Noblesville (14-2-3) is No. 35 in the nation. The Kingsmen are No. 1 in Indiana, and Noblesville is No. 5 in the state. Penn advanced to the Semi-state after a 3-1 win against the Mustangs of Munster High School on Monday, Oct. 16, in the South Bend Regional. On the scoresheet for the Kingsmen were Maya Lacognato, Molly McLaughlin, and Kristina Lynch. Penn has overpowered opponents this season, outscoring its rivals 119-3. One of those earlier matches was against Noblesville. The Kingsmen won 2-1 on Saturday, Sept. 23. Lynch scored both goals for the Kingsmen, one in the 22nd minute, and one in the 55th minute. Not only will Penn face a tough test in Noblesville, it will have to overcome a playing surface that they aren’t too familiar with this season. 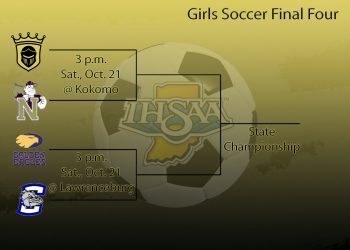 Saturday’s Semi-state matchup in Kokomo will be played on artificial turf, something the girls are not accustomed to as they have played on grass fields all regular season. Senior captain Molly McLaughlin recently returned to the Penn squad from a serious foot injury suffered in the spring. “For me personally, I have more pain in my foot when I play on turf, but for the team, there are some advantages,” McLaughlin said. “She said that the Kingsmen love to play quickly and intricately, and she noted that the turf allows for that and keeps the ball moving at a quick pace. When asked her thoughts about semi-state and facing Noblesville, McLaughlin was calm and collected. She did not show any nerves or seem anxious in the slightest, as she has been on this stage before. This is McLaughlin’s third state title run with the Kingsmen after she moved to Indiana from Seattle late in her freshman year. “Pressure-wise, I know what it’s like to win, and I know that it’s like to lose in the state championship,” McLaughlin said. McLaughlin believes that both winning, and more importantly the experience of losing state as a sophomore has been vital in both her and her team’s mindset going into this last state run as a Penn girls soccer player. If you can’t attend the match, you can follow @The_Pennant on Twitter for live, up-to-the-minute updates on the Kingsmen.